Early case assessment (ECA) has traditionally been a critical component of any corporation’s e-discovery workflow. But with data volumes rising and data types becoming increasingly complex, smart teams have begun to leverage the merits of early case assessment for both pre-discovery and e-discovery. 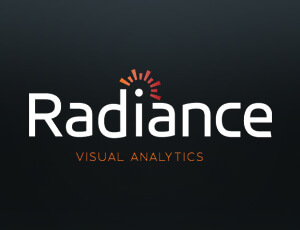 The Radiance visual analytics platform will transform your current ECA process via a robust connection framework, a comprehensive data enrichment process, and a library of powerful visualizations which allow teams to quickly narrow and “cull” vast amounts of data during the assessment phase. More than a simple culling tool, Radiance leverages a comprehensive enrichment process and visual analytics to discover fact patterns, identify key themes and individuals and assess document complexity in advance of a compliance or legal matter. But more than just a culling tool the Radiance platform offers a powerful search engine, highly faceted browse capabilities and a library of visualizations that can help teams rapidly identify key documents, see communication patters, isolate high-risk or confidential information and inventory collections based on file types, custodians and more. 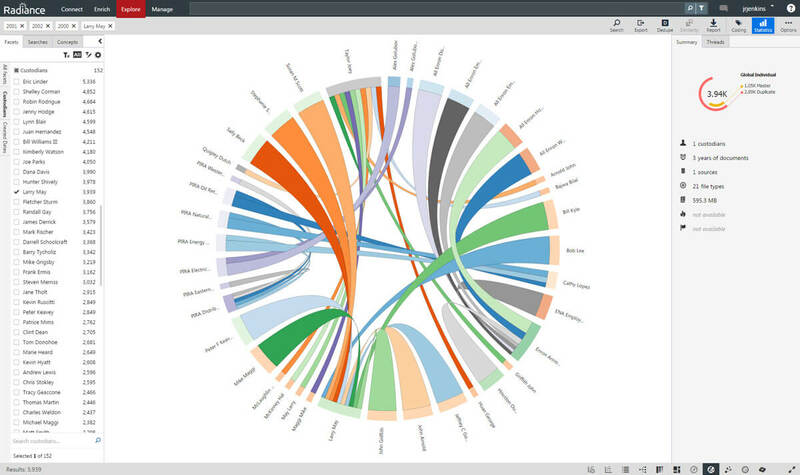 With these capabilities Radiance helps power smarter e-discovery workflows, supports early data and case assessments and creates a sophisticated, yet easy-to-use platform for analysis projects across the enterprise. The Radiance early case assessment workflow – connect, enrich, analyze and visualize – is a proven recipe for success during pre-discovery analysis and is the quickest path from unknown to known for any-sized collection. With a flexible architecture which can connect directly to a variety of data sources – both behind the firewall and in the cloud, the Radiance platform rapidly transforms critical data from disparate custodians or offices into a single, highly faceted workspace. Here teams can search, browse, explore and analyze data across time, custodians and locations to quickly discover critical themes and documents at the center of any e-discovery matter and quickly determine next steps for the document collection. The Radiance platform is a highly scalable, fast and cost-effective platform for managing complex electronic data. While nimble enough to manage gigabyte sized projects, the software was designed to deliver standout performance on massive data volumes that include hundreds of millions of documents and files. Radiance can also be used as a secure repository for evidence objects and metadata to support collaboration among compliance and legal teams.